About: Chocolate contains theobromine and caffeine which are toxic to cats. Both compounds are a central nervous stimulant. The darker the chocolate, the higher the level of theobromine. Dry cocoa powder contains the highest levels and white chocolate contains almost none. Symptoms: Vomiting, drooling, agitation, hyperactivity, rapid breathing, tremors, and seizures. Treatment: Gastric decontamination, activated charcoal, anto-seizure medications and supportive care. No, pet guardians should not give chocolate to cats. The roasted beans of the cacao plant, which chocolate is derived from, contains naturally occurring methylxanthines which are a group of alkaloids (a plant compound which has a central nervous system effect on animals and humans). Chocolate contains both theobromine and caffeine which serve the seeds well, their toxic properties protect the seeds from being consumed by insects. Dogs are generally more susceptible to chocolate poisoning than cats, no doubt because they are more likely to consume large quantities of chocolate, whereas cats are generally more selective eaters as well as being unable to taste sweetness so chocolate doesn’t hold the same appeal as it does with dogs and humans. Different kinds of chocolate contain different levels of theobromine, the darker and more bitter the chocolate, the more dangerous it is. Cooking chocolate and cocoa contains the highest levels of theobromine, followed by dark chocolate, milk chocolate, and white chocolate. The chart below lists the levels of theobromine in various types of chocolate. According to Nutrition Data, below is the quantity of caffeine and theobromine in various types of chocolate. 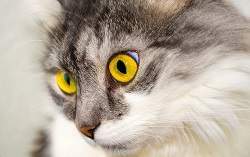 What is the lethal dose of theobromine in cats? The lethal dose of theobromine poisoning is as little as 100 – 200 mg per kg of body weight and 150 mg per kg of body weight for caffeine. Ingestion of theobromine lower than the lethal dose can still cause acute and life-threatening symptoms. As we have already noted, caffeine is toxic to cats also, however, the levels of caffeine in chocolate are fairly low and cats metabolise this much faster than they do theobromine, so this article will focus mostly on that. Another less commonly talked about problem with chocolate is its high-fat content which can lead to pancreatitis in cats. This is an extremely painful condition in which the pancreas becomes inflamed due to the inappropriate activation of digestive enzymes which begin to break down the pancreas. There are a number of causes, including high levels of fat in the blood (hyperlipidemia). As we have already said, theobromine and caffeine are there to protect the seeds (beans) from insects consuming them. Both compounds cause a variety of central nervous symptoms, respiratory and cardiovascular symptoms in cats and dogs (we all know caffeine is a stimulant to humans too, but we are able to metabolise it much quicker than cats and dogs, plus we are larger. It acts as a diuretic, causing the body to lose fluids via the urine. Cardiac stimulant, causing the heart to race. Theobromine cause central nervous system stimulation, diuresis (increased urine production), cardiac muscle stimulation and smooth muscle relaxation. The answer depends on the amount and the type of chocolate your cat consumed. White chocolate has so little theobromine in it it is of no significance. Milk chocolate contains higher levels of theobromine, and it would only take a row of chocolate (approximately 4 squares) from a standard bar for him to ingest enough theobromine to develop symptoms. Dark chocolate, baking chocolate, and dry cocoa powder are the biggest risks and if your cat has consumed any of these, call your poisons hotline or speak to your veterinarian. Please be aware that even if your cat hasn’t ingested enough chocolate to cause symptoms of theobromine toxicity, he is at risk of developing pancreatitis due to the high-fat content. This is an extremely painful condition which occurs when digestive enzymes begin to break down the pancreas. Symptoms vary in the age of the cat (kittens are more susceptible than adults due to their smaller size), the quantity of chocolate consumed as well as the type of chocolate eaten. Dry cocoa powder and the darker chocolates contain higher amounts of theobromine and therefore are more dangerous. Your veterinarian will perform a physical examination of your cat and obtain a medical history from you including the type and amount of chocolate consumed. Diagnosis is based on a history of exposure, physical symptoms, chemical detection of alkaloids in the stomach contents, blood serum or urine profiles. Where possible, bring along a sample of your cat’s vomit for your veterinarian to have a look at. This can assist with diagnosis. There is no antidote for chocolate poisoning in cats. Treatment is aimed at removing the chocolate from the stomach if possible or preventing further absorption. Unfortunately, theobromine is reabsorbed through the urinary bladder, so treatment may need to be continued for up to 24 hours to ensure thorough removal. Induce vomiting: If the ingestion of chocolate has been within 2 hours. Administer activated charcoal: This prevents any further absorption of theobromine. Intubation and artificial ventilation: For cats who are having difficulty breathing. Intravenous fluids: To treat dehydration caused by vomiting and diarrhea and to assist in flushing out the toxins by increasing urine production. Medications to control tremors and seizures: Such as diazepam or a barbiturate. Urinary catheter: To prevent the reabsorption of toxins. Cardiac monitoring (ECG): If the heart rate is elevated, medications to slow it down such as beta-blockers may be prescribed. It is possible to get safe chocolate specifically for cats. I personally am not a fan of the idea. Cats can’t discriminate between cat chocolate and normal chocolate so I would rather avoid giving a cat any kind of chocolate. There are lots of other safe treats if we want to spoil our cats. The following article has a number of foods which are safe for cats. Human foods cats can eat. Obviously, don’t give your cats chocolate, don’t leave chocolate lying around where your cats can get to it and educate children about the dangers of chocolate toxicity in cats. Previous articleCat Milk – Can Cats Drink Milk?